“..….But you can’t fool all of the people all of the time”. Requests for Transparency, Advance Notice and Early Public Involvement in developments and finances have been long-standing Community concerns. The following Council meeting agenda items points out why residents should be concerned. The 2016 Mayor‘s Task Force on Community Engagement - Achieving Transparency was presented by Task Force member Councillor Croft, and was the last item on the agenda. The last place positioning of this important community document signifies how Council prioritized the implementation of the 2012 Task Force on Community Engagement recommendations. Many are still gathering dust. The Community Task Force was re-instigated in 2015 and provided a Report to Council in mid-April 2016. It was rejected and sent back for revision. It was presented again on December 11th, 2017, well beyond a year and a half later, it appears that the plan to implement any public consultation recommendations is comparable to the implementation schedule of the 2012 Community Engagement recommendations. This delay strategy is all too familiar: for example, it is similar to the four years it took for the Mayor to attempt to “correct” a Council zoning mistake that allowed overbuilding on small lots. In 2013 he formed a Floor Area Committee that included an over-representation of development “stakeholders” to remedy the mistake. The outcome resulted in the same overbuilding problem on small lots we see today. At the COW meeting a member of the public explained that there are transparency standards and practices set out by the International Association for Public Participation that are available and should be followed. There is also no shortage of public participation methods and models available throughout Canada. They all advocate open government far and above Council’s limited opportunities for public input. A café style meeting with seven round-tables with up to ten people at each table. Desired Outcome(s): Feedback on the models contained in the draft report; ideas for future public engagement opportunities (e.g. ideas as to when and how the public may be engaged in various municipal undertakings). 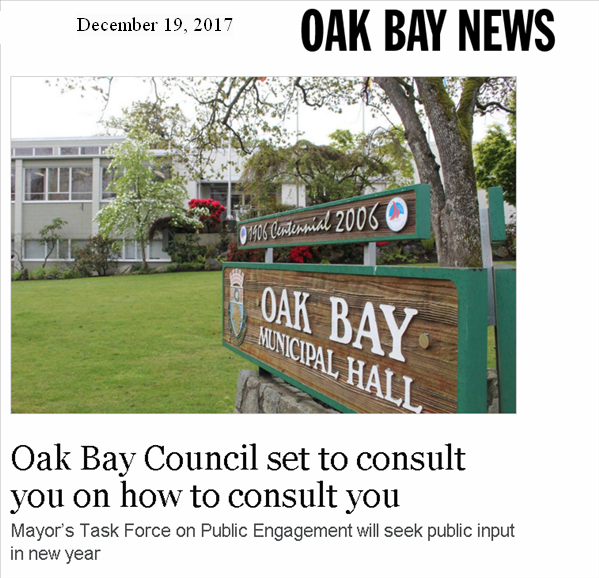 The purpose then for Oak Bay’s planned “Town Hall” meeting will be to hold a meeting to determine how the Community would like to be consulted - de facto, an oversized focus group (Attachment # 1 - even the Oak Bay News did not miss this absurdity). It is not clear if this will include how Town Hall Meetings should be conducted. Councillors Murdoch and Braithwaite spoke against this proposal. Councillor Braithwaite explained that many communities hold regular open Town Hall meetings. At these meetings, Councillors can be questioned about their decisions and all residents can hear and respond to their answers. Round-table discussions are problematic as they confine the discussion to only the small group; allow whoever collects the information to interpret the findings and prevent a meaningful two-way conversation with all Council members. Some Councillors indicated open meetings are certainly preferable (See Note* Oak Bay Council Meeting December 11, 2017 below, regarding Victoria’s 2018 Budget Town Hall). The 2016 Task Force Community Engagement Report refers to the 2012 Community Engagement Report recommendations. The recommendation to hold quarterly interactive public engagement meetings has not been accomplished. Also, for some unknown reason, a primary recommendation to improve the “Large Project Process” has been omitted. 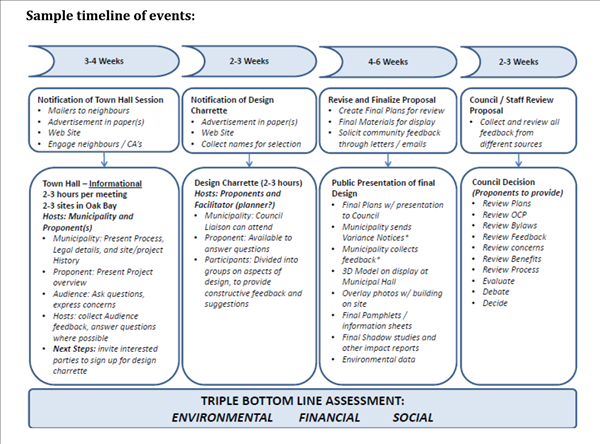 Perhaps this is because the 2012 Community Engagement Report Pages 43/44 provides a comprehensive “information gathering and decision-making process” for Large Redevelopments” (see Attachment #2). Been provided with many more opportunities for input, valuable to Council for Large Project developments. The bottom line is the Community would have a much better understanding of why Council is approving and considering large projects that far exceed the Zoning Bylaw and massing requirements. A motion to accept the Task Force Community Engagement Report was carried (3-2) with Councillors Murdoch and Braithwaite against. Agenda Item #3: HRA Subdivision Proposal Foul Bay Rd at Brighton. As indicated in previous Oak Bay Watch Newsletters, Bare Land Strata Subdivisions and Heritage Revitalization Agreement (HRA) Subdivisions take precedence over Zoning Bylaws and have been used as a means of “intensive densification”. Subdivision proposal at Brighton and Foul Bay Road (Heritage Revitalization Agreement). see Municipal website for COW meeting agendas for dates noted below, including plans, reports, and details. This item was presented for a second time. It had not been approved by Council at the earlier September 18, 2017 Committee of the Whole Meeting due to neighbours’ concerns regarding, loss of privacy and trees, increased density and traffic, inadequate parking, and setbacks. Heritage Commission members also had concerns about the lack of green space. Nevertheless with all these concerns, on September 18, 2017 when the HRA subdivision proposal was first introduced, staff still recommended development approval. At the December 11, 2017 COW meeting the owner/developer applicant had made considerable modifications to the proposal and held further consultations with neighbours, stating many of their concerns were now satisfied. He also said he had reduced his request for four new additional houses on the subdivided lot to three and used the new space to add setbacks to the other units and the heritage home on the property. This saved many of the trees and provided much more privacy for neighbours. Mayor Jenson said he would have preferred the heritage home be a “conversion” to three residences – in effect condos. The applicant explained this would have meant gutting the home and destroying the significant heritage interior (leaving just a heritage shell). He also said this was contrary to his agreement with neighbours and would not be acceptable to them. Major Jensen insisted his preference was for a three-residence conversion in the heritage “revitalized” dwelling. Council has not announced a 2018 Provisional Budget and all indications are they do not intend to. To date the 2018 Annual Budget has been identified in Council agendas and the Press as the second year of the Financial Plan Bylaw i.e. 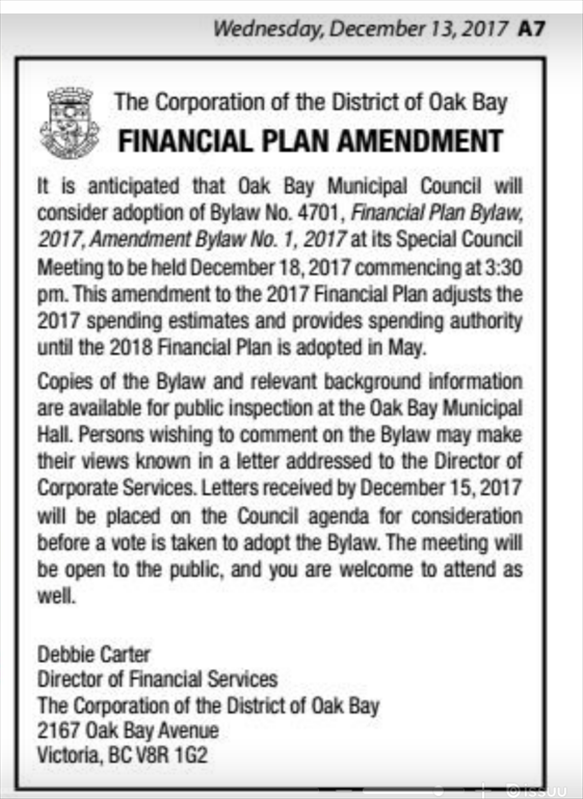 Amendment Bylaw # 4701 - see Council agenda December 11, 2017 on municipal website and a small 2 ½ in x 3 ½ Oak Bay News ad on December 13, 2017 (Attachment #3). "Section 166 of the Community Charter and section 816 of the Local Government Act, require the local government to undertake a process of public consultation regarding a proposed financial plan before it is adopted. The legislation does not specify the format of the public consultation process and it may be varied at the local government's discretion to suit the local community. ­Public consultation could include such methods as town hall meetings, surveys, focus groups, open houses, use of websites and newspaper ads. (Note: Council has chosen the least informative of these options - and they certainly don't comply with the intent of the Provincial legislation". "It is intended that backup documentation also be prepared to give as much detailed information as needed to the council or to the board and to the local government’s staff. This documentation would not form part of the bylaw, but it could be used to provide information to taxpayers and members of the public or as part of the financial plan consultation process". Victoria for example, and in comparison to Oak Bay, has a 1,120 page five-year Financial Plan that includes a detailed 2018 Provisional Annual Budget. The intent is to provide a basic understanding of the Financial Plan and 2018 Budget. The Victoria Five-Year Financial Plan 2018 Process started in April 2017 and the Plan includes an index, framework & policies including Reserve Fund policies, comparisons to the previous year, and financial impacts and many more details. Councillors Murdoch and Braithwaite opposed the two other Councillors and the Mayor who voted for a bylaw to exclude sewage treatment plant capital costs from property taxes. The bylaw made sewage plant taxation much less transparent; prevented a true understanding of how much these taxes will be; and also preventing those who might prefer or need to defer their municipal taxes. Councillor Murdoch explained that it does not matter where these taxes are reported, they still have to be paid. Residents have a right to know that this in effect means that the starting point for property tax increases next year is 2.9%. For example, if the 2018 property tax increase for other purposes equals last year‘s 4.9%, reported by Council Murdoch, the total property tax increase next year would be almost 8%. It is easy to understand now why some Council members would want to disguise the new sewage treatment plant increases by including them in the water bill. Note: Up until this year the Council Provisional Budget Report provided some modest detail in an expenditure and revenue single page. However, at least it provided residents with an estimate of what the property tax increase was going to be the following year. This year no such property tax estimate is provided. It is too bad that the implementation of recommendations and policies that benefit existing residents do not keep up with Council’s brisk pace of approving developments - there would be somewhat less cause for concern. ​“Transparency and information are required for accountability and responsibility” Oak Bay Watch. P a g e 43 | 44 Significant Project Case Study: Large Redevelopment To test and demonstrate the use of community engagement priorities matrix, the Community Engagement Working Group looked at how such a model could be used for a significant redevelopment project or initiative requiring a Development Variance Permit (DVP) but not a rezoning. A significant redevelopment is defined in this case by a project in which the broader community, and not just immediate neighbours, would be impacted. 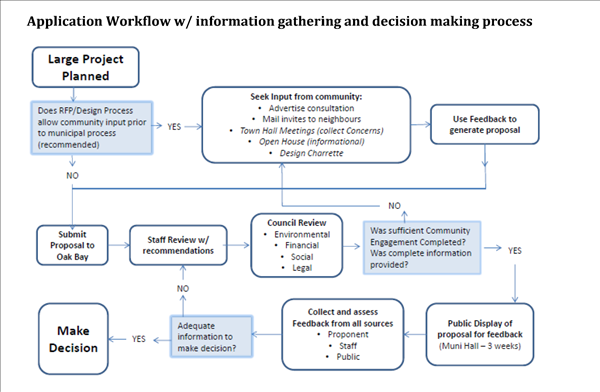 Application Workflow w/ information gathering and decision making process. Note: The Municipal Advertisement below does not indicate that the 2018 provisional budget is the second year of this Financial Plan Amendment. Also note the date it was published, two days after the December 11, 2017 Council Meeting held to discuss it. Holding a Council meeting on a Wednesday mid-afternoon (3:30 pm) when most residents are at work was also suspect. With minimal information to work with and residents working to pay their taxes, most likely this is why only 3 of 18,000 plus residents attended the approximate 10-minute Council meeting. The block vote (3 - 2) to hide the treatment plant sewage costs was predictable.